A man was arrested after he slammed his vehicle into a patio on Plaza Blvd. and drove off. 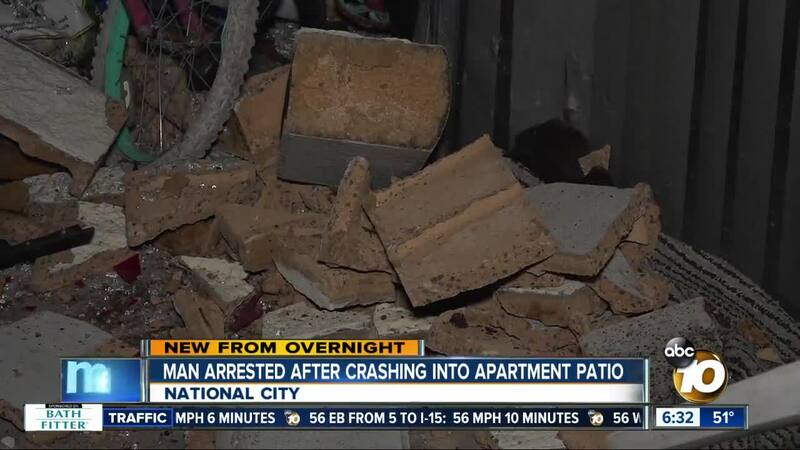 NATIONAL CITY, Calif. (KGTV) - A driver was arrested early Friday morning after police said he crashed his car into a patio at a National City apartment and drove away. Just after 12 a.m., National City police arrived at an apartment building in the 2700 block of Plaza Boulevard to find a patio badly damaged and a sliding window caved in. Parts from a car were left at the scene, which helped officers track down the vehicle involved. A short time later, officers spotted the silver Dodge Charger a few blocks away at a 7-Eleven and watched a man leave the store and get into the car’s driver’s seat. Officers stopped the driver before he could leave and arrested him on suspicion of hit-and-run. 10News learned he was being evaluated for a possible DUI. No one in the apartment was injured.